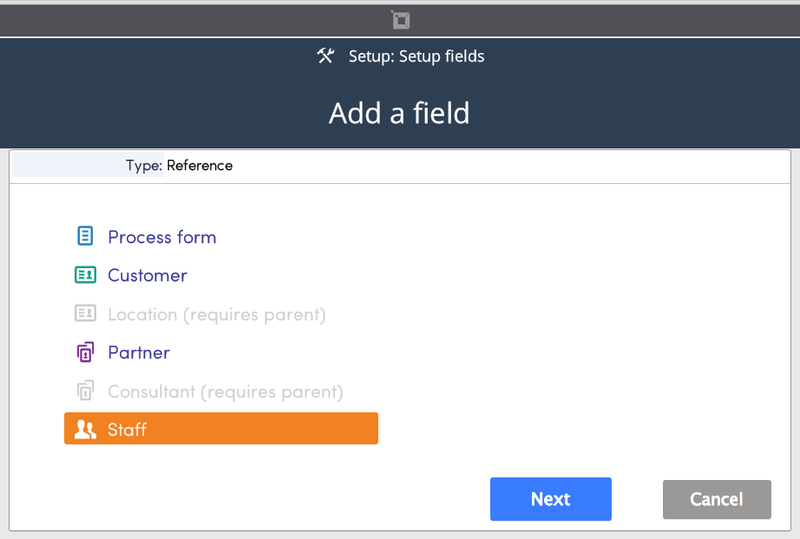 A Reference field allows you to pull data from other places in RPM Telco. For example, data from Supplier, Customer, Agency, Rep, Process form and Staff can be referenced through the use of a Reference field. To add a reference field choose Reference field from the field menu located on the left of the Fields tab. Add a Customer reference field when you want to reference the list of customers you have entered into RPM Telco. Checking the Start link in processes box, box corresponding to On details page means that the process you are referencing will be shown, with a Start link, on the forms that process is referenced in. Add a Agency reference field when you want to reference the list of partners you have entered into RPM Telco. Add a Staff reference field when you want to reference the list of staff you have entered into RPM Telco. With a Staff reference field you have the ability to choose what role(s) will populate in the staff reference list. If you want to limit this list to a specific role you have created, choose it from the Role list. You can also limit the users that will be populated in the staff reference drop down list to those who are currently enabled. Supplier: this reference fields will show the suppliers that are added to your subscription. Supplier fixed: you can select a 'fixed' supplier, that means that users cannot select a supplier it will be the one you select. Supplier multi select: this reference field is a multi select field that allows you the check off multiple suppliers. 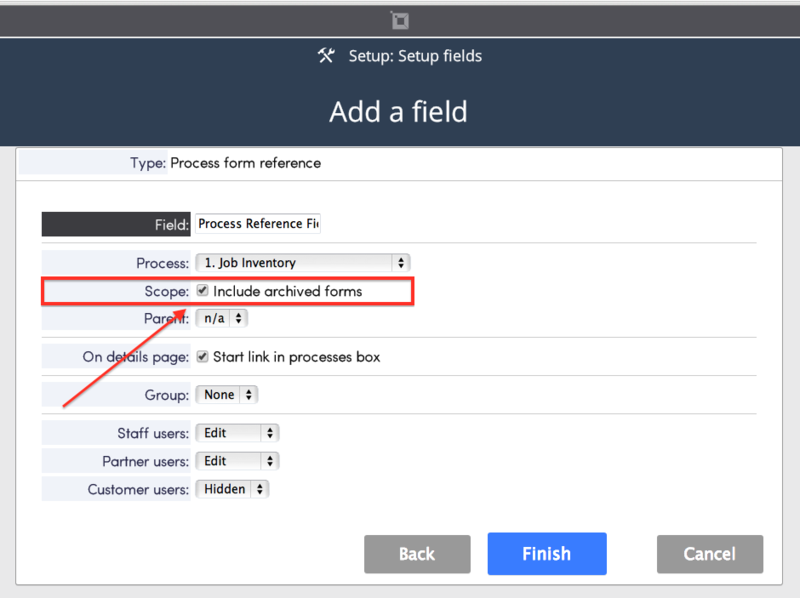 A Process form reference field allows you to pull data from another process and create a link between 2 forms in different (or the same) process. In this case, we want to include data contained in the Commission Inquiry process, so we choose it from the Process drop down box. The Scope refers to the forms which will be referenced. If you want to include forms that have been archived, click the check box. To add a Process form reference you have the option to enter a parent.